Written by Alex Lynch on 01 April 2017 . 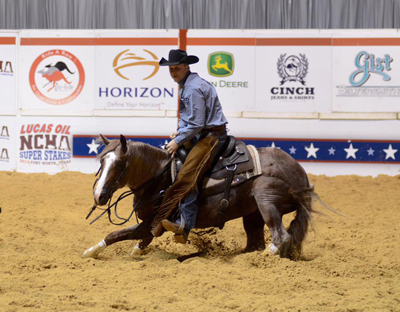 Metallic Rebel makes his presence known when he steps into the cutting pen, and his showing with Equi-Stat Elite $3 Million Rider Beau Galyean at the National Cutting Horse Association (NCHA) Super Stakes was a familiar scene. The Classic Open brought 26 of the cutting industry’s top athletes to the Will Rogers Coliseum, but Metallic Rebel edged out those competitors by 5 points when he marked a huge 229 for owner Thomas Guinn. Their killer run earned Galyean and the Alivin and Becky Fults-bred stallion a hefty paycheck of $28,608. That pushed 5-year-old Metallic Rebel (Metallic Cat x Sweet Abra x Abrakadabracre) to lifetime earnings of $255,460. CR Tuff Lucy (Woody Be Tuff x Lucindas Catolena x High Brow Cat) and Equi-Stat Elite $4 Million Rider John Mitchell picked up the Reserve Championship and $25,804 after earning a 224. The 6-year-old mare was bred by Center Ranch and is owned by Slate River Ranch.